Mooove Over Cow’s Milk, Plant Milks Are Gaining Popularity (and How To Make Your Own)! Parents are known for telling their kids to “drink your milk”, and five or ten years ago this was almost always cow’s milk in a typical U.S. household. We are told you need to drink milk for strong bones and teeth, calcium, Vitamin D and more. In recent times, many people have discovered they cannot drink cow’s milk (or choose not to) – maybe they are lactose-intolerant or have a milk allergy, perhaps they choose not to consume animal products, or any number of other reasons why drinking cow’s milk may not be an option for them. So say hello to plant milks! Generally referred to as nut milks (although can be from other plant types too) plant milks are defined as any edible milk-like substance that is derived from a plant. Many plant milks are now adding calcium and Vitamin D in comparable amounts to cow’s milk (read the labels and do some comparisons). There are even flavored versions available – Vanilla and Chocolate alongside the Original flavors. Even if you are a die-hard cow’s milk fan, you may be missing out on some very delicious options – plant milks have interesting flavor notes, are great in smoothies and other recipes, several are easy to make at home, and you never know when you may need a non-dairy option someday for the lactose-intolerant or vegan friends coming to your holiday dinner or child’s birthday party. Open your recipe book and create new variations on your favorite milk-containing recipes, you may be pleasantly surprised at the delicious results! What Types of Plants Can Be Used to Make Plant Milk? Next morning rinse well, then add 3 cups of water. Place all in blender and mix on high-speed 2-3 minutes until smooth and no large pieces. Pour into cheesecloth bag and squeeze milk into container. Can save pulp to use as a base for seed cheese, as a thickener for recipes or as a porridge ingredient. Here’s a great video of how to make raw hazelnut milk using our own E3 Nut Milk and Sprouting Bag – by the way, you can purchase these durable, reusable bags on http://www.e3live.com, they are great! Grains – Rice milk leads the pack in popularity for grain milk, which is made from fermented grain or flour. Other notable grain milk candidates are oats, spelt, rye, quinoa and einkorn wheat, just to name a few. 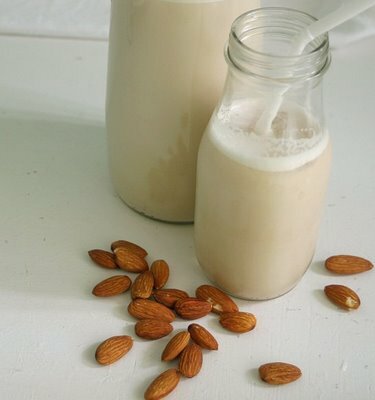 Grain milks, like rice milk, are made similar to the recipe above for almond milk, but you would start with cooked rice instead of soaked almonds. Soak 1 cup of raw shelled sunflower seeds overnight. Rinse sunflower seeds and add to high-powered blender. Fill blender container with water approximately 1/2 full. Add all ingredients and blend until liquefied (add more water if needed). Strain through cheesecloth if desired. Legumes – the most well-known of all the plant milks is actually in the legume category, this would be soy milk. It’s readily available in most grocery stores – but you can also make your own at home and use it fresh. Other legumes can be made into milk – lupin, pea, and peanut to name a few. Making soy milk is a bit more involved than making the other milks, several steps of cooking involved, but may be worthwhile if you like to know what ingredients are in the milk that results. How Should I Store My Freshly Made Plant Milk? If you made it at home, fresh plant milk should be refrigerated and used within a few days if possible. Remember there are no preservatives in the milk you made, but it’s so good that it will not last long! What Else Can I Try For Flavoring My Plant Milk? Experiment! Be sure to try different flavorings, such as vanilla bean or pure vanilla extract, saffron, cardamom, cinnamon, nutmeg, cloves, cocoa and more– the possibilities are endless! Just remember to start with a small amount of flavoring and go from there, often a little goes a long way. Tell us your experiences with plant milks – what’s your favorite? Have you made any at home? Any favorite recipes that you used plant milk in? Why do you like plant milks? The BEST nut milk bag ever! It will last indefinitely!